Ottawa Senators owner Eugene Melnyk on Monday announced the team has reached a contract extension with GM Bryan Murray through the 2015-16 season. 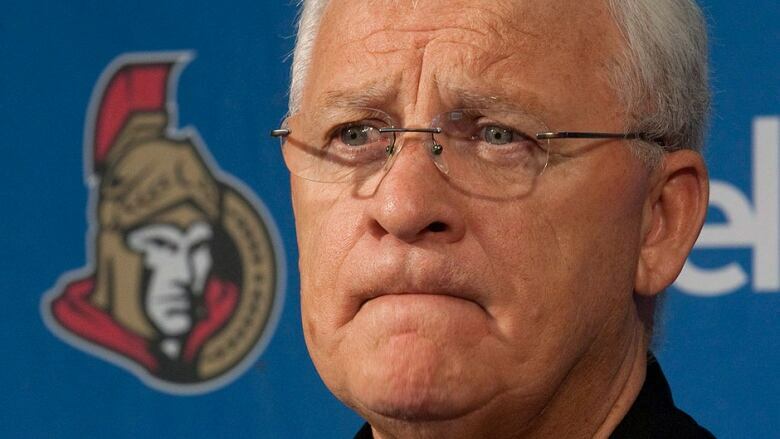 The Ottawa Senators want general manager Bryan Murray to stay on a little longer after losing his heir apparent to the Buffalo Sabres last week. Senators owner Eugene Melnyk on Monday announced the National Hockey League team has reached a contract extension with Murray through the 2015-16 season. On Thursday, Murray's nephew Tim left his post as assistant GM in Ottawa to become Sabres GM. Melnyk also announced that Bryan Murray has been named president of hockey operations. He'll continue his GM's duties for the next two seasons and remain with the organization in an advisory role. "Without question, Bryan stands among the best general managers in the National Hockey League," Melnyk said in a statement released by the team. "Our drafting success and the emergence of so many young, dynamic players within our organization is a testament to Bryan's leadership and wealth of hockey knowledge." In other front-office moves, the Senators have promoted Pierre Dorion and Randy Lee to assistant GM. Melnyk noted the pair's numerous acheivements in scouting, drafting and player development. "Bryan [Murray] and I believe both Pierre and Randy have more than earned the oppportunity to take on more senior roles in hockey operations." The Senators struggled for much of the first half of this season, going 14-17-7 before a recent run put them within two points of the final playoff spot in the Eastern Conference. Success made working out an extension for Murray easier because Melnyk wanted to negotiate during an "upswing" and "ensure that nobody ever would think that this was some kind of knee-jerk reaction to what was not an optimal beginning to the season." Murray first joined the Senators as head coach on June 8, 2004 and compiled a record of 107-55-20 in two-plus seasons. He led Ottawa to the Stanley Cup Finals in 2007, falling in five games to the Anaheim Ducks and was named the club's sixth GM on June 18, 2007. Murray returned to the bench in February 2008, relieving John Paddock, and guided the Senators to a 7-9-2 mark in the final 18 games of the regular season. On July 1, 2009, he added the title of executive vice president of Senators Sports & Entertainment to his portfolio. "This team has come a long way and we have seen real growth over these past three seasons," Murray said in a statement. "I know that with the pool of talent we have assembled, both on and off the ice, and our desire to improve at every level, that we are on the right path to develop this team into a group talented enough to compete for championships." Added Melnyk on a conference call Monday: "We think that we have all the core group in place. I think if we were on the same trajectory as we have been over the last few years, that it's ultimately going to lead to a championship-type team." Previously, Murray, who hails from Shawville, Que., served as senior vice president and GM in Anaheim, where he also coached for one season in 2001-02. He is in his 19th season as a GM, having served four years with the Detroit Red Wings, six-plus campaigns with Florida and two seasons with the Ducks. Murray began his NHL coaching career on Nov. 11, 1981 in Washington and has also stood behind the bench in Detroit and Florida. He won coach of the year honours in 1983-84 with the Capitals. Murray is considering moves before the trade deadline to bolster Ottawa's playoff hopes, and he and his assistants will have some work to do on current contracts. "We understand that we've got about five players that are important parts of the present team that we have to make a decision on and do a contract for," he said. "We're kind of setting ourselves up to do that." Winger Milan Michalek and defenceman Chris Phillips are set to be unrestricted free agents this summer, while goaltender Robin Lehner will be a restricted free agent. Captain Jason Spezza, winger Bobby Ryan and defenceman Marc Methot are up in the summer of 2015. "As we go forward over the next few months we'll make contact with the agents and see in a couple cases if we can extend them," Murray said without naming names. Dorion is in his seventh season with the Senators, having spent the last five years as director of player personnel. Previously the team's chief amateur scout, he will now be responsible for contracts and salary arbitration while managing the Senators' professional and amateur scouting staffs. In addition, Dorion will oversee all facets of evaluation for players inside and outside the organization. Before arriving in Ottawa in July 2007, he worked in scouting for the New York Rangers and Montreal Canadiens. Lee has spent 18-plus seasons with the Senators and his fifth as director of hockey operations and player development. The married father of three has also served as the team's conditioning and player development coach, video and conditioning coach and video coach. Lee's duties as assistant GM will see him become GM of the Senators' American Hockey League affiliate in Binghamton, N.Y. He will be responsible for contracts and several tasks involving player development, including the management of the club's budgets and overseeing the development of players throughout the system. That includes prospects at the AHL, collegiate, junior and European league levels.